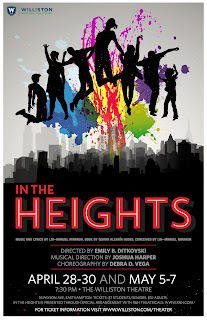 May 5, 6, and 7, starting each night at 7:30 p.m.
Before he revolutionized Broadway with Hamilton, the musical that mashed hip-hop with American history, playwright and actor Lin-Manuel Miranda launched his remarkable career with another genre-redefining musical, In the Heights. That production, set in New York’s Washington Heights neighborhood, explored Latino and immigrant culture and won four Tony Awards in 2008, including Best Musical. Miranda’s music and lyrics for the show, which combine elements of Latin salsa and hip-hop, also won the 2009 Grammy Award for Best Musical Theater Album. 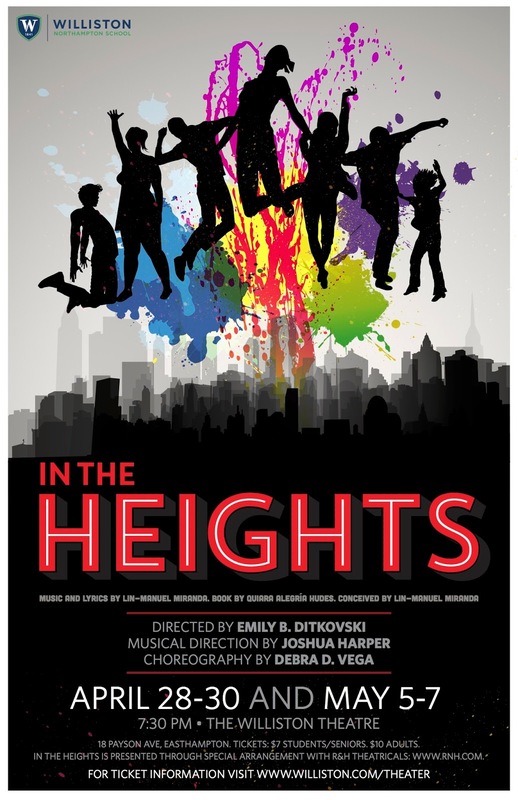 So it’s not surprising that Williston Northampton School theater director Emily Ditkovski calls In the Heights “one of my favorite musicals of all time. I was dying to do it.” She gets her chance, April 28, 29, and 30 and May 5, 6, and 7, when the Williston Theater brings the Broadway smash to Easthampton. “It’s been an amazing journey,” Ms. Ditkovski says, and she means that in all senses of the phrase. To help her cast better understand the origin of the production, she traveled in January with her students to New York City, where they met with faculty and staff of the City University of New York’s Dominican Studies Institute and got to hear firsthand about the play’s development over lunch with members of the original Broadway cast (see http://willistonblogs.com/artsspotlight/2016/01/25/in-the-heights-research-in-new-york/). But preparing for the play has also been a journey of discovery for her students, as they immersed themselves in new cultures to better understand the context of the musical. In the Heights tells the story of Usnavi, a bodega owner (named for what his parents first saw upon arriving in America: a U.S. Navy ship), and other residents of the largely Dominican American Washington Heights neighborhood. Usnavi has his eye on Vanessa, who works in the neighboring beauty salon, and he dreams of winning the lottery and returning to his native Dominican Republic. Over the course of three eventful days, Usnavi and others in his community experience heartbreaks, make sacrifices, and celebrate triumphs as they face changes in their neighborhood and in their personal lives. Ultimately, the play becomes an exploration of timeless human values, with lessons that apply to audiences and communities everywhere. Miranda, the show’s creator, has made a point of encouraging high schools all over the country to perform the work, citing how valuable theater was to him when he was in high school. Ms. Ditkovsi needed little persuasion, but she also understood the challenges. Audiences will be able to see the results over two weekends, April 28, 29, and 30 and May 5, 6, and 7, starting each night at 7:30 p.m. Tickets are $10 (general admission) and $7 (students/seniors), available at wnsboxoffice.tixato.com/buy. Amherst, Smith, Mount Holyoke, and Hampshire Colleges, and the University of Massachusetts. Williston’s community of over 500 students provides a diverse and culturally rich educational experience for students.